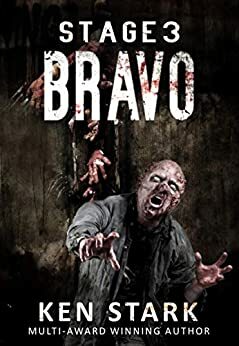 From the author of the post-apocalyptic, zombie horror novels, Stage 3 and Stage 3: Alpha, Stage 3: Bravo is a fast-paced, nail-biting thriller for fans of The Walking Dead and World War Z.
Hank Mason had nothing left to lose. And then came the others. 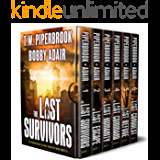 Though these seven souls had somehow survived the first days of the epidemic, every minute of life in this new world came at a price. How much were they were willing to pay to survive? Now, those precious few are in a desperate race to save one more lost soul, and time is running out. The clock started ticking the moment they pulled into that forgotten little corner of a world gone insane. Every second brings them closer to death. They'll have to find a way out... or die trying. 5.0 out of 5 stars5 out of 5 Captivating Stars for this one! Does the power of love and friendship really know no bounds? Something so strong and compelling that nothing can possibly stand in its way. A noble idea is it not? Would you personally be willing to sacrifice your very life if it meant saving your friends and loved ones from the same fate? What if the method of your demise involved being torn apart by a horde of ravenous zombies? If these notions have piqued your interest, then Stage 3: Bravo by author Ken Stark is an absolute must read! 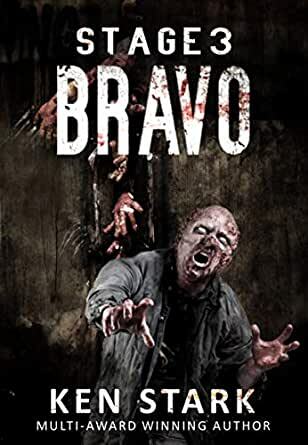 It is an action packed and exhilarating novel which explores the characteristics of friendship and loyalty amidst the backdrop of a relentless zombie infestation. Hold onto your hat for this one! Essentially, the novel revolves around the struggles of a band of survivors led by Hank Mason- or Mace as he likes to be called. The world as they know it has been taken over by a viral epidemic and each passing day is a life and death struggle. If they are not ripped apart by voracious zombies, they may very well be taken out by other survivors who will do whatever it takes to continue to live. It is against this backdrop that Mace and his team come across what seems to be a deserted college campus. However, they soon find out that it is far from abandoned. Not only is it overrun by insatiable zombies, but there is also another group of survivors present... and they do not seem happy to see Mace and his crew. Nevertheless, before any overt conflict can occur, all sides are promptly forced to retreat to safety within the complex as a zombie horde makes a bee-line towards the fresh meat. Now trapped within the walls, the two sides must learn how to cooperate and survive together, or become zombie fodder. What follows is the ultimate struggle for survival in this terrifying new world. Will the two groups do what is needed and combine as one? Or has their fate already been sealed with any chance of escape evaporated under the guise of obstinate stubbornness and the gnashing of zombie teeth! To say that the plot of this novel is fast moving and full of action would be the understatement of the century. The action is relentless, carefully orchestrated and entirely captivating. There are a great mixture of battle scenes, but there is also a variety of very clever survival scenarios. For instance, we are able to see the group creating makeshift weapons and discovering food in the most difficult of places. All of this is wonderfully supported by the very human theme of friendship and love. In fact, the human relationships which exist are what make the plot of this story so strong. Without this we lose the believability and authentic elements which are so very critical to the story development. There can be little doubt that this tale is a gripping page turner! Another element of this novel which receives top marks is in the area of character development. While the protagonist is obviously Mace, there are a variety of other characters who are unique, engaging and developed beautifully. My personal favourites were Mack and Alejandra. The author quite capably manages to allow the readers to identify, empathize and relate to the host of characters through Mace's perspective. We are able to feel the emotions of love, happiness, anger and fear... and attribute them to the different individuals. Not only that, but the characters experience significant growth throughout the story. Some who are entirely "unlikeable" at the outset of the tale ended up revealing a whole different side to themselves by the end. This is character development at its best. Overall I simply loved this book and would give it my highest recommendation. Be forewarned that there are a number of violent and graphic scenes (of course... what type of zombie apocalypse story dopes not have graphic scenes!). If you are a fan of this genre you will be able to enjoy the smooth flowing writing and top-notch story telling which it contains. An exhilarating and fascinating look at the human condition amidst a zombie infiltration! 5.0 out of 5 starsBrilliantly written! In the third book of this series, Stage 3, it seemed like there were only a few survivors left on the surface of the Earth who were not infected by the malicious virus (or possibly obtained immunity unknowingly.) The virus invaded people's brains and ate away the frontal-lobe! Yes, this series is about how humans lost their cognitive function and transformed into sightless, insatiate, carnivorous Zombies (alpha) in the apocalyptic climax. Mr. Stark's brilliant writing skills depict the battle scenes against the alpha so vividly that it makes readers see the actions in their mind as if watching a horrendous movie. It is terrorizing and gripping. The section that explains how the virus becomes a rampage and insurgent is well executed; it's evident that the author had done a great deal of research in this area. Although there are some redundancies in the fighting scenes that slow the pace a little, it does not affect the overall strength of the plot. In the midst of a horrific scenario, the author infuses the profound friendship, team spirits, tender love, and sacrifice, which make the characters likable and believable. In addition, as a tremendous wordsmith, he reflects the heart-wrenching sentiment of the main character, Mason's, mindset as he faces the end of the world. Allow me to share a small section from a paragraph with you. I recommend this book to anyone who is a fan of a zombie-apocalyptic tale! 5.0 out of 5 starsOutstanding in every way possible! Ken is one of my favorite authors, and this new book delivers everything I expected and so much more. From the very first page to the last, it captures you, pulling you in with wit, charm, anticipation, danger, love, courage, all of what is going to happen, which never ends up being what you think. He is an outstanding talented author. Like his previous works, this book is fast paced with action that will have your heart palpitating. Be careful it doesn’t send it into cardiac arrest. Mace the main character is constantly evolving and after having read the first two books I was craving more of Mace and in this third installment, I not only got that but a few more characters that I’ve fallen for. At times… oh, who am I kidding, all of the time you are made to feel like you are right in the room, on the street, everywhere the character goes, you go right along with them. I loved the weapon making. The decisions each of them have hanging over their heads. The nail-biting times and the calmer times. This is an outstanding story, one that I highly recommend. Get the other two as well. You won’t regret it. First off, I have to say that I normally don't read post-apocalyptic stories, especially ones with zombies, and I probably won't read another. The gore just doesn't appeal to me in the fight scenes. That said, I did find the relationships between characters in this story very compelling, and there were heroes among them that I liked. A knight in shining armor always has my heart. Not that there were knights in this story, but the heroic characteristic was there. The book is well written with good pacing, ratcheting up the pace in the tense moments, then relaxing so the reader gets to know the characters. The dialogue was natural and fit each character's voice, and I think fans of this type of story will enjoy this one. From start to finish your attention is riveted upon the fight for survival with a varied cast of characters. To learn the true cause of the virus and it's chilling after effects is mind blowing.